Butterfly implosion? - Page 3 - Lampwork Etc. So here is my latest butterfly implosion. You can't see the antennas in the pic, but there pretty good. wow, I'm trying to to keep my jaw shut, but it just keeps popping open again. Good morning everyone. I was looking through the threads for a floral marble tut, and found one, but the link listed no longer works. I've been searching, but with no luck, I was wondering if anyone knew of a link or maybe an old tutorial on them. I've never made one before and would love to try. Would marble beads also be considered "off mandrel"? I think your kitty's a little cranky today. He needs some milk!! Hey, check out this website: www.icanhascheezburger.com if you heart kitties!! I feel like that at work some days, haha!! Location: Elk, WA, "The Last Chance Ranch"
Sabina is a friend of mine and I remember when she started doing these at an event at Momka's.. I believe she won 1st place at a flame-off last year in Oregon... I watched her make these... And Chris, yours, too, are real pieces of art.. I had to give this a try even though my implosions have been iffy and I have no clue how to get the maria off the mandrel (my cold punties don't stay cold). I used an EDP encased in black for the wings and an yellow dotted with orange for the tail. I put the whole thing on a 10mm clear moretti because my hothead has a tendancy to melt the punty faster than the implosion. It worked better than my other attempts but I think I fried the clear a bit waiting for the 10mm to melt enough. My butterfly was elongating so I stuck some clear underneath it and pushed it up. It looks to me that if I had enough patience I could have kept heating and marving until I got the butterly pushed into the middle of the bead. It looks almost like the black spread, because it appears to be almost the same color as the purple, only transparent. never seen such a thing- they are beautiful!!! Location: Alaska, I was here first! I've tried a couple of these and the wings are just waay too thick, I want them thin and delicate....any suggestions? I've tried 1mm stringers too, and they still come out thick, maybe I'm mashing them flat before the implode? whats the trick to get the butterfly more 3d looking? I did a couple and I don't think I have that concept down completely! Practice! Don't push the rod down to hard on the marver...a little more than just resting it might help. Oh wow.. now this is something really amazing. I love them!!! I can't wait to try these. Very pretty! Thanks Kare! Do you have a tip to make it more 3-d?? I'm new to this forum, so not sure if I'm responding correctly. Chris your butterfly implosion is so beautiful. You said you were going to try same thing in soft glass. did you? Are there any pics? 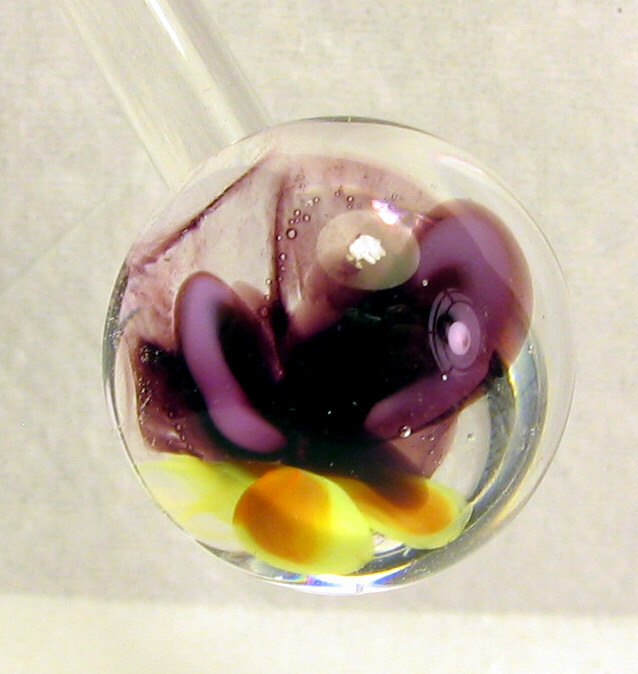 I haven't worked with boro yet and hae been trying to do implosions in soft glass--nut much sucess though....do you know of a good tutorial or video clip of an implosiono bead??? youtube.com has implosion flower but i dont remember who did that tut very impressive. Wow! I just found this tut. Very beautiful work! I was wondering how did you made the third marble, the one with the butterfly on top of the flower. Very nice!